Atmospheric dust storms are common in many of the world's semi-arid and arid regions and can impact local, regional, and even global weather, agriculture, public health, transportation, industry, and ocean health. 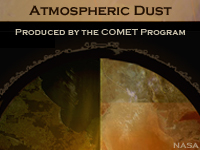 This module takes a multifaceted approach to studying atmospheric dust storms. The first chapter examines the impacts of dust storms, the physical processes involved in their life cycle, their source regions, and their climatology. The second chapter explores satellite products (notably dust RGBs) and dust models used for dust detection and monitoring, and presents a process for forecasting dust storms. The third and final chapter of the module examines the major types of dust storms: those that are synoptically forced, such as pre- and post-frontal dust storms and those induced by large-scale trade winds; and those caused by mesoscale systems such as downslope winds, gap flow, convection, and inversion downburst storms. THIS EXERCISE HAS REALLY IMPROVED MY UNDERSTANDING AND KNOWLEDGE OF THIS VERY IMPORTANT PHENOMENA THAT IS AFFECTING US. Very interesting and useful lessons. Very good contents which helped my understanding a lot.One possible correction : In Chapter II 'confirming dust height' / 'Comparing MODIS and CALIPSO', labels in the cross section image on the right top (South "A" /Norhth "B" ) seem that they should be swapped each other. Tres bonne description de la poussiere avec des examples concrets ET des image satellites de bonne definition et des animation permettant de mieux cerner le sujet.